So it's been a while since I've worked on this deck. I decided to revisit it a couple of days ago, and looked at the flow on the website. When I looked at all the cards together the deck seemed lifeless. I knew I wouldn't be able to get a good reading off of them if they didn't inspire me to begin with. I decided to do some reformatting. I changed the Japanese font to something a less rigid in design. I also began to add more color to all of the cards. All cards, save The Dark, now have two colors instead of just the one for the magical element. I really liked the way they are turning out. You can see all of the finished recolored cards side by side at this website This website also has a toggle in the corner that shows what all the cards looked like before. I hope you like the new colorized versions. I feel much better about them. Thank you for your kind comments. I didn't actually see the comments until now. I never got an email for them. Anyways, if you want to link them you can, and I do plan to continue with them. I don't think I will make the characters as cards, as I want to be able to have them printed easily, and they would push me past the basic card package. If I have room, I might to Kero as you suggested, as he is a magical creature. of any posts. Did you find that option? Will you be selling these soon? I really like your clow cards! They look really great. I just wanted to tell you a few things I've noticed about some of the cards. The Erase: she's missing the poofy frills on her neck, some patterns on her jester hat, and the diamond on her cheek. The Firey: she's missing her long pointy ears, and some lines for her arms. The Nothing: she seems very hidden. I think seeing her a little more would be better. I like the bold colors you chose for each card. They really look amazing Great job! 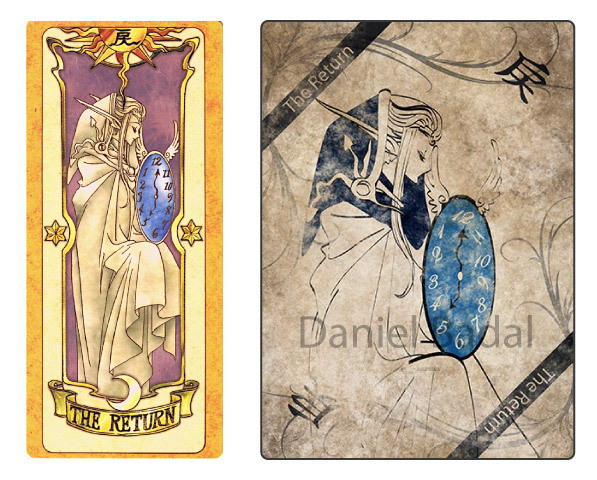 I had a set of Clow Cards for a while but felt like an imposter reading with such a bubbly looking deck. This will be perfect. Have to respectfully disagree with the previous poster about The Nothing, I think what you've done with it is brilliant. When I look at it I feel as if I'm fading to nothing. The somewhat muted colors and mottled texture effect will really put the user into an introspective divinitory frame of mind. Love Love Love these cards! Will they be available from Gamecrafter? I will be keeping an eye on this thread to "capture" these as soon as possible. I agree with this concept about fading to nothing. 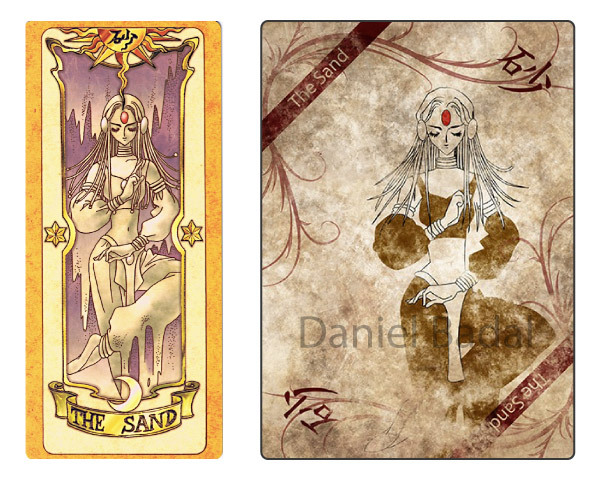 In the series, the Nothing card was the most powerful card, because that one card is what balances the other 52 Clow Cards. But the Nothing card also had a very sad expression because she was lonely. I really felt like the Nothing card should show her expression, and perhaps fade the rest of her into nothingness. Thank you all for your kind words. I thought I was watching the thread, but didn't see these. I need to look into it again. I really appreciate the feedback, and will work on showing more of The Nothing's expression, as I can see that it is important. I've been trying to figure out a style that I really like before going forward. If you visit the webpage here you can see the style I'm currently toying with. It's the fifth take I've done on the basic info part of the cards as well as background. I'm just not sure. I'm wondering what you guys think. Do you like the dark background better? and what do you think of the new way to display names and kanji(Japanese Character)? I think I like it, but I'm not really sure. I thought that the cards were too dark before, but now I feel like they might be too light. I haven't tried putting the new text display over the darker background. Not really sure what to do. I also forgot to link to The Return and The Sand, when I uploaded them. Thanks again for checking these out. I should be able to get back to these next week when things finally settle down and I stop traveling. Some of english names with the bars look too bold, so try fading it maybe? Just be careful not to lose the white lettering though. I personally like it a lot! The way you designed the wisps and curves in the corners, and the way you coloured each card, and the stain effect, really looks amazing. It looks like the traditional ink prints, and I really admire it.